13. Next newsletter: October 2014This newsletter is published monthly. For more frequent news updates, please visit the IMIA News site at news.imia.info or the main IMIA website. IMIA Board and General Assembly members/representatives should note that the GA2014 will be on 31 October in New Delhi; the Board meet the day before. Formal notices has been sent to GA members (22 July and 29 August). Additional notices will be sent in early October with information on accessing documents for the meeting. If you are a GA member and have not received the notices, please let the IMIA Office know, so that we can check we have correct details in the email databases. (IMIA Board and GA meetings are by invitation only). This will be the first IMIA GA to be held in India.We are pleased to inform you that the 8th Asia Pacific Association for Medical Informatics 2014 Conference (APAMI 2014) is being organised and hosted by IAMI in New Delhi, India from 30th Oct to 2nd November 2014. A first-time collaboration between IAMI and AIIMS, the conference aims to encourage researchers, surgeons, practitioners, young scientists, healthcare workers and suppliers from across the world to cooperate and share knowledge and experience about how to use information technology to improve the healthcare status of the people. The conference theme 'Health IT Solutions for Improving Patient Care'resonates with the kind of ecosystem that healthcare providers aim to build by harnessing technology. APAMI 2014 is an ode to India’s unique position as a global technology and software solutions provider as well as an inexpensive but modern healthcare destination. A special registration package has been set for IMIA Board and General Assembly members coming from abroad. The organisers of the HELINA2014 conference regret to have announce, due to cirumstances beyond their control, a postponement of the event - see http://conf.helina-online.org/index.php/2014/oct2014/announcement/view/17 for information. The 9th Health Informatics in Africa Conference - HELINA 2014 - was due to take place in Accra, Ghana from 11 - 15 October 2014. Due to the outbreak of Ebola in the West Africa region, and as part of measures to prevent the outbreak of Ebola in Ghana, the Government of Ghana on Thursday August 14, 2014 placed a three month ban on all international conferences and gatherings in the Country. In view of this uncontrollable circumstance HELINA and GHIA Council announce the postponement of the conference, to 7-11 March 2015. The submission deadline is therefore extended to 16 November 2014. Further information will be provided when it is available. The INFOLAC2014 conference will be held in Montevideo, Uruguay on 16-17 October, 2014. INFOLAC 2014, the Latin American Conference on Medical Informatics (Conferencia Latinoamericana de Informática Médica) is organised by the Sociedad Uruguaya de Informática en Salud (SUIS - the Uruguayan Society of Health Informatics -http://www.suis.org.uy), an IMIA Member Society, and Sociedad Uruguaya de Estandarización, Intercambio e Integración de Datos e Información de Servicios de Salud (SUEIIDISS - http://www.sueiidiss.org).Information is available via http://www.infolac2014.org on the programme, registration, etc. The IMIA Yearbook of Medical Informatics 2014 has now been fully published. All content (59 files) is available open access and free of charge at http://www.schattauer.de/de/magazine/uebersicht/zeitschriften-a-z/imia-yearbook/imia-yearbook-2014.html IMIA's grateful thanks go to the Editorial Team, and our publishers Schattauer, for all their hard work and support in producing this first online-only edition.This 2014 Yearbook is the 23rd in the series (first published in 1992), and plans are being discussed for a special 25th anniversary edition in 2016. We welcome any and all comments on the IMIA Yearbook, so that we can continuously improve. As IMIA is fully funding the costs of producing the Yearbook, we also need to demonstrate its continuing value, and so welcome comments on the continuation of the new model, which will be reported to the IMIA General Assembly in the future. ACI, Applied Clinical Informatics (Appl Clin Inform - http://www.aci-journal.org/), Schattauer Publishers' first weekly online journal, received its first impact factor for citations to papers published in 2012 and 2011 (IF 2013 = 0.386). ACI is an official eJournal of the International Medical Informatics Association (IMIA) and the Association of Medical Directors of Information Systems. ACI aims to establish a platform that allows sharing knowledge between clinical medicine and health IT specialists as well as bridging gaps between visionary design and successful and pragmatic deployment.Dr Gunther Eysenbach, Founding Editor and Publisher of JMIR (http://www.jmir.org/), has once again provided a report on the most recent impact factors in his blog (read his full report/analysis at http://gunther-eysenbach.blogspot.ca/2014/07/impact-factors-2013-medical-informatics.html). 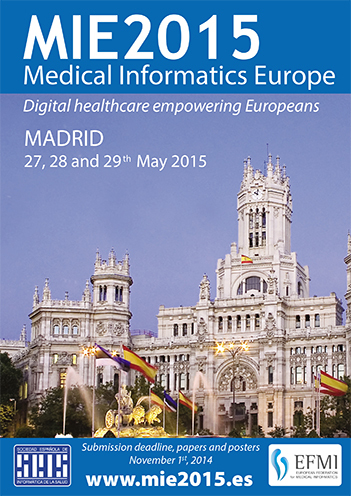 MIE2015, the 26th European Medical Informatics Conference, will be held in Madrid, Spain on 27-29 May, 2015. The conference theme will be "Digital healthcare empowering Europeans". Key dates and the opening of the Call for Submissions are available at http://www.mie2015.es/MainDates.htmlThe closing dates for submissions will be 01 November 2014 (papers and posters) and 15 November for workshops, panels, etc.Full information will be updated at http://www.mie2015.es as it becomes available. MIE2015 will be hosted by SEIS (Sociedad Española de Informática de la Salud – the Spanish Society of Health Informatics – www.seis.es). Don Newsham, Chair of GT2015 and CEO of COACH: Canada’s Health Informatics Association (http://www.coachorg.com), is pleased to announce the Call for Papers for GT2015 (www.GT2015.org), the 4th such conference, open to all academic, healthcare, health informatics and telehealth professionals from Canada and around the world. This international conference will be held on May 29-30, 2015 in Toronto. On behalf of Conference Co-Chairs Jennifer Zelmer and Kendall Ho, COACH would welcome you to Canada and to this special conference with the theme Serving the Underserved: Integrating Technology and Information for Better Healthcare. Full information on the GT2015 Call is at www.GT2015.org - submission deadline for Full and Short Papers isDecember 1, 2014. The PDF file here also gives further detail on important dates. Papers are invited under three guided themes: cultural and socio-economic factors; latest, cutting-edge technology; and extending access. HIMSS15, the HIMSS Annual Conference and Exhibition, will be held on April 12-16, 2015 in Chicago, IL, USA. Further information will be available through the conference website in due course - http://www.himssconference.org IMIA will, once again, be an Endorser of the event. Information on submission, registration, etc. will be updated on the HIMSS15 website. The ITCH2015 conference (International Conference on Information Technology & Communications in Health), organised by the University of Victoria School of Health Information Science will be held on February 26 – March 01, 2015 at the Inn at Laurel Point, Victoria, BC, Canada. The theme of ITCH2015 is Driving quality in informatics: Fulfilling the Promise, and national and international papers and posters are invited. Seehttp://www.uvic.ca/hsd/itch/index.php for details. The deadline for submission of complete papers is September 15, 2014, and for professional posters is 01 November, 2014. The deadline for workshop proposals is 01 October.